“I may steal that…you may see that again.”—Matthew Carter, in reference to a glyph design in 1403 Vintage Mono Pro. 1403 Vintage Mono Pro was inspired by the IBM 1403 mainframe line printer. The idea to create it was sparked by Mark VandeWettering wondering aloud if a font existed reminiscent of that printer. This all uppercase, monospace typeface was quickly expanded from the initial 52 characters making up the A and H print chains to over 1,500 glyphs, supporting most languages that use the Latin alphabet (including Vietnamese), Cyrillic, Greek, and Hebrew. Small capital forms were added to act as lowercase. Continued research, design, and development led to a new release in early 2016 with over 2,300 glyphs, along with refinements throughout. 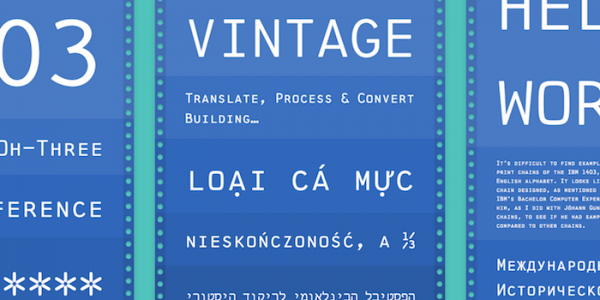 During the creation of 1403 Vintage Mono Pro, a few blog posts were written about the history and progress of designing the typeface. At TypeCon 2013, Jeff Kellem gave a well-received presentation on Resurrecting Type of the IBM 1403 and heard nice compliments about the 1403 typeface during the conference and the TypeCrit critique session. He was also invited to talk about it at Hackers Conference 29, November 2013. On Wednesday, 20 November 2013, the Computer History Museum (@ComputerHistory) in Mountain View, California, USA opened The 1401 Demo Lab exhibit with two working, restored IBM 1401 mainframes, 1403 printers, card punches & sorters, tape libraries, and related equipment (see the restoration team's progress status updates and a nice post on the restoration by project lead Robert Garner). Weekly demonstrations happen on Wednesdays at 3pm PT and Saturdays at 11am PT. Another great exhibit to visit at the museum! See the printer that inspired this typeface! In addition to small caps, the following OpenType features are included: contextual fractions, including pre-built fractions, and support for arbitrary fractions up to 10 numerators and denominators; superscripts, subscripts, and scientific inferiors; ordinals; dotted zeros for slashed zero; historical variants; and locale variants for Bulgarian, Moldovian, Romanian, Polish, Catalan, Navajo. 1403 Vintage Mono Pro specimen (PDF) (updated with the February 2016 release). Let us know if you use our typefaces in your projects. A custom subset was designed to recreate the 1977 SETI Wow! signal printout from an IBM 1403 mainframe line printer (all CGI) in Trevor Brymer’s short film 6EQUJ5 [IMDb], released in 2016. “A tale of love, loss, and signals from outer space.” Here’s a sample image from the film, courtesy of Trevor Brymer. Jason Oberg (@ExtraBlase) used the 1403 Vintage Mono typeface in the book cover design for Talk Nerdy to Me: Grantland's Guide to the Advanced Analytics Revolution (2014). The book's in the 2014 MIT Sloan Sports Analytics Conference (@SloanSportsConf) attendee gift bag. You can buy the sports analytics compilation from Grantland (@Grantland33). Read our blog post about it.